the sculpture will be the size of female lion and/or a ginormous dog. It will have multiple animatronic movements but will stay in a stationary laying position. The movements will be: stomach and chest breathing, complex finger and wrist movement, eyes, and extensive facial and tail movement. The creature will have hair in some some spots well other will be bare. I'm going for an extremely realistic look with much detail so I've been juggling what to make the hero skin out of. Im falling more towards a silicone skin than a foam with a fiber glass skeleton but I'm also ignorant on different or newer materials. I'm working with basic shop tools and don't have access to large machines. I've attached the sculpty "sketch" if you will. Extremely excited to hear your thoughts! Cool looking character you have there! One common option for a character that size would be foam latex, though at that scale you would need to make a custom oven to bake the skins. You could reduce the oven size by breaking the character down into smaller skins, like head, arm, leg, etc. Silicone would be your other main material option. The challenges there are weight (it can be heavy) and expense. Depending on your character design you could use something like silicone for the exposed skin, and have hair/fur covered areas be another material. You could also use silicone where you need more transparency, like the face, tail, and hands/feet, then run foam for the arms/legs/neck/body. But again that depends on what the final character will look like, as blending the materials could be a challenge. Fiberglass is a great option for the internal structure. Thanks Chris! 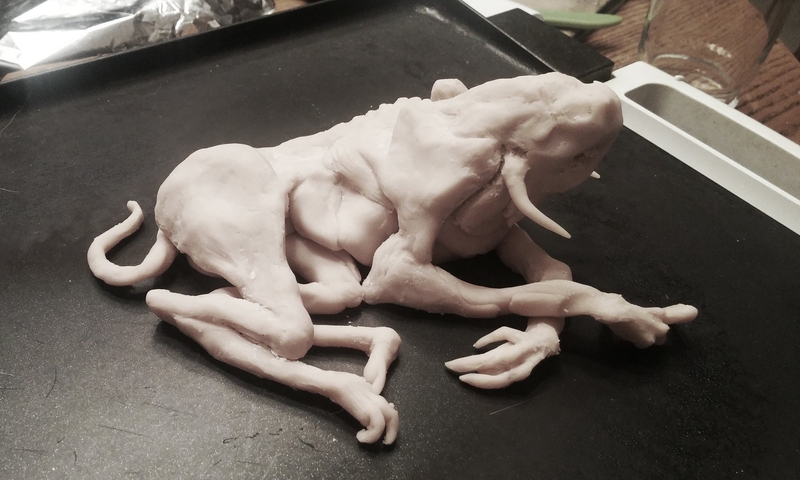 The creature will be mostly skin much like a hairless ape or some kind of sick animals that is losing its hair, thoughts? Do you know any tutorials on building a custom oven? Also do you have a specific names for produce that are industry standard? Silicone can be heavy.. very heavy so if you go that way then you might have to beef up your animatronic servo's etc. Foam Latex is much lighter but presents it's own problems. With your creation being mostly hairless - how translucent is the skin. If it is a solid color then you have multiple options like Latex or Silicone. If the skin is translucent and shows subtle internal colors then Silicone would be best. But you don't have to have the silicone the full thickness of the skin. i.e. 2 -3 mils for the translucent layer, then paint the underlying pastels, and then complete the job with a foaming silicone. There are some foaming silicones like Soma_Foama from Smooth On which would give you the bulk but without the weight issues. As for Latex - that is easier to use and I have seen some people give the mold a quick thin skin before pumping in the foam. An large oven can be fairly easy to make - a large wooden packing case.. A heater, and a fan to keep the temperature constant can be a good start. Line the inside of the box with foil to reflect the heat and use Gaffa tape to seal the gaps. 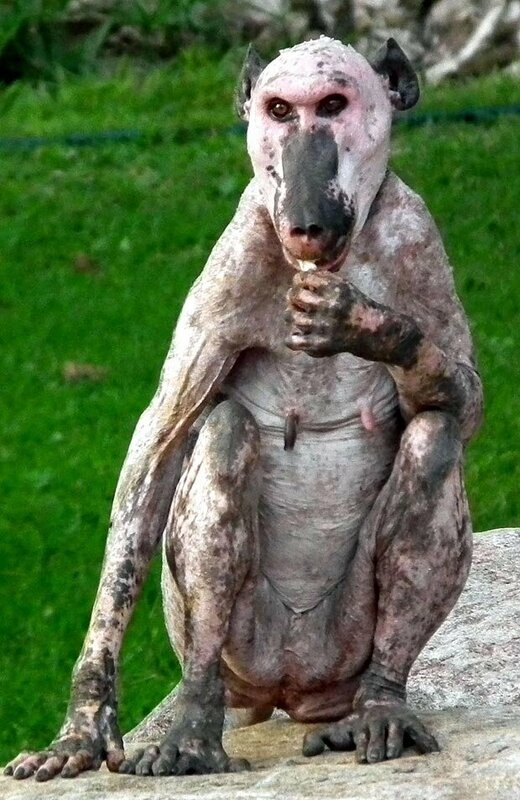 Hey David, The paint job would be similar to this hairless baboon. Let me see if I'm understanding the foaming silicone idea. So I could do a thin layer of silicone in the mold to get the transparency, let that dry than beef it up with the smooth-on product? You can do a lot with painting techniques to give the appearance of translucency on foam latex. Also, that image will forever haunt my nightmares. Crazy it's been almost a year since I had this idea, so I decided to go with a platinum cure silicone for the face to get the most expression. Now I'm at a stand still, do I want to spend the money to cast platinum silicone...which would be...a lot, or go with foam which I have learned is a lot in itself to work with, buying a mixer, building an oven, etc. I was thinking about casting the body, hands, etc. An idea to save money would go with a tin cure silicone, does anyone know a cheap tin or maybe there is a Secret product on the market? I've also made molds from tin silicone chalking but never casted anything in the mix, anyone have an practice with this? One option to save some money would be to use a urethan foam for the body. It would last longer than foam latex, but can be a bit more stiff. The lower the density the more flex you'll get. I've only ever used silicone caulking to make silicone paints, but I do know folks that have used it to fabricate skins and props before. You could always try a small experiment to see if it would suit your needs. To give it more strength you can apply it to a spandex or two way stretch "power mesh" material.